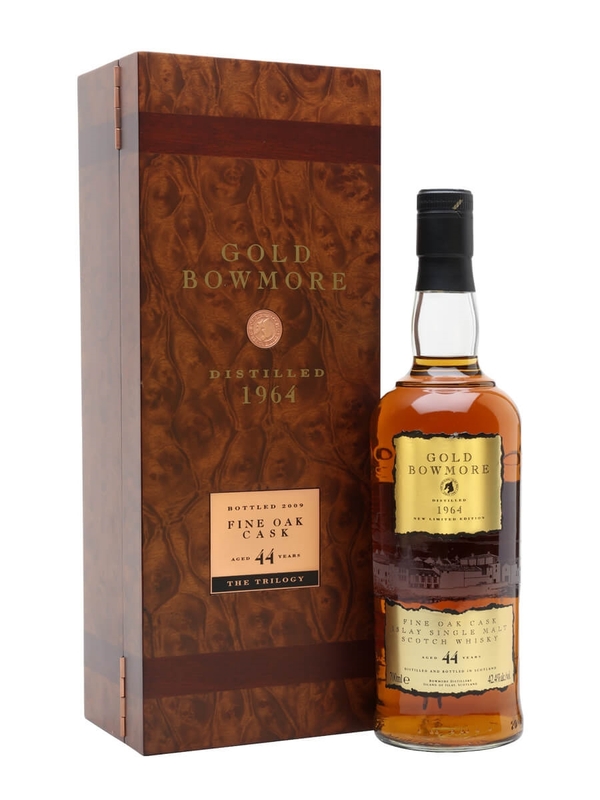 44 years of quiet maturation in the famous number one vaults, has allowed an exceptional and rare example of Bowmore single malt to develop – the oldest one ever to be released from the distillery. Deep gold color. Surprisingly lively for its age on the nose. A complex array of fruit (tangerine, sultana, pink grapefruit, papaya and the general overall citrus DNA that you’ll find in old Bowmores), with balancing notes of honey and vanilla. A hint of damp smoke and coconut. Just like with Black Bowmore, this is a texturally soothing whisky on the palate, which continues to evolve in waves—first the sweet honey, coating vanilla and lively fruit, then turning quite visceral, with juicy oak, damp earth, deep peat smoke, and charcoal, followed by another wave of fruit (this time dried fruit), finishing off with subtle charred oak and roasted nuts. This whisky is better than White Bowmore and it falls just short of Black Bowmore (which I rated 97) because it’s just a bit softer, less vibrant on the palate. Exceptional whisky. In the same line of Bowmore bottlings from the 60s. A real gem. Has a great taste. UND ABFAHRT! Starts with a nose of Floridian pink grapefruit and takes you on an endless fruity roller-coaster. Incredibly elegant, without being dominated by the oakiness you'd expect in a whisky that's been around since the Beatles started playing in the Cavern Club. There's a minute amount of smoke left on your palate at the very end, but the final tribute is still more citrus than charcoal.